Acanthodoris hudsoni is a species of sea slug, a dorid nudibranch, a shell-less marine opisthobranch gastropod mollusk in the family Onchidorididae. Hudson's dorid, Hudson's yellow margin nudibranch, Hudson's spiny doris, yellow margin dorid. This species is named after natural history artist Captain Charles B. Hudson. Individuals feature a highly papillated dorsum, with yellow tipped tall conical papillae and translucent white base color. 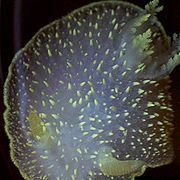 The lamellate club rhinophores and five branchial plumes are tipped with yellow and the edge of the dorsum is highlighted with an opaque milky yellow stripe. In some specimens the dorsum border and tips of the papillae are cream white rather than yellow. The lateral teeth bear 5 to 8 denticles and individuals can reach an overall size of 20 mm. This species is very similar in appearance to Cadlina luteomarginata and the two are often confused. Unlike most dorid nudibranchs, Acanthodoris hudsoni feeds on bryozoans, of the genus Alcyonidium sp. The life cycle of nudibranchs is very short, spanning from 2 months to a year in the wild. Mating- Nudibranchs, also called sea slugs, are simultaneous hermaphrodites, they possess both male and female functional reproductive systems. They have one gonad, the ovotestis, that functions as the male and femal organ. When mating, two individuals exchange sperm, each one fertilizing the other's eggs. Eggs are laid in masses close to a source of food for the emerging larvae. Trochophore Larva- This larval stage is shortened and takes place entirely within the egg, before hatching. The larvae are round in shape and have cilia that are used for sensory and defensive functions. Veliger Larva- The hatched plantonic larvae of nudibranchs are called veligers, and each have a tiny shell, which disappears when the larva metamorphoses into the adult form. This stage lives in the water column above the ocean floor. Veliger larvae have a velum that consists of two large lobes with cilia on the fringe and is used for swimming and feeding. Juvenile- The veliger larva goes to the ocean floor and becomes benthic. At this stage metamorphosis into juveniles occurs. Juveniles resemble adults but are smaller and sexually immature, individuals then grow steadily without dramatic form changes into a sexually mature adult nudibranch. Behrens, D.W., 1991. Pacific Coast Nudibranchs: A Guide to the Opisthobranchs Alaska to Baja California.- 2nd ed. Sea Challengers. Monterey, CA. Lamb, A. and Hanby, B.P., 2005. Marine Life of the Pacific Northwest: A Photographic Encyclopedia of Invertebrates, Seaweeds, and Selected Fishes. Harbour Publishing. Madeira Park, BC. Southern Cross University. 2004. Order Nudibranchia: Suborder Doridoidea. http://www.scu.edu.au/schools/esm/staff/pages/shartley/projects/molluscs/dorids.html. This page was last modified on 11 May 2010, at 19:24.